I don't know about you, but bubbles have always fascinated me since I was a kid. And after catching the Bubble Legendary show at Resorts World Sentosa on its opening night, I concluded that the love for bubbles is truly universal among all kids... and perhaps some adults too. 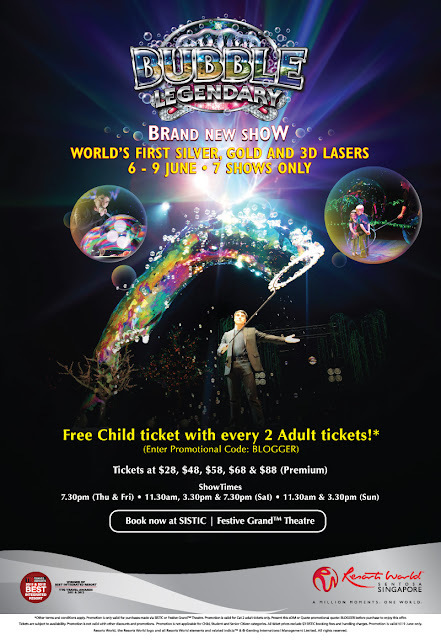 Bubble Legendary is the brand new bubble show featuring the world’s first Silver, Gold and 3D lasers. 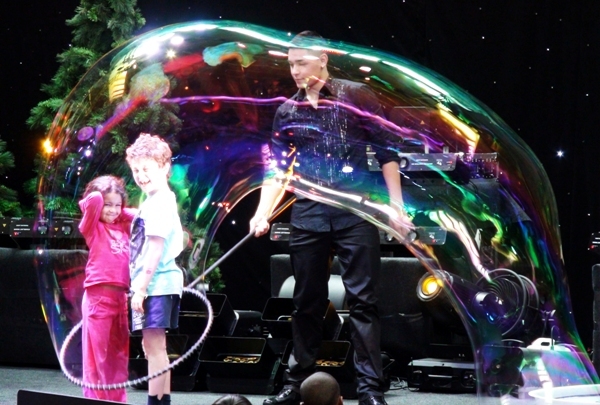 A creation by Fan Yang, of the Gazillion Bubble Show fame and World’s Greatest Bubble Artist holder of 18 Guinness World Records, the show is dubbed as a blissfully fun, colourful and interactive show suitable for audiences of all ages. And naturally, the monkies were all hyped up to see a "gazillion of bubbles", as they put it. You know, I have always thought that The Bubble Man, Fan Yang, is of Chinese descent. Turned out I was totally incorrect - His father is Hungarian, and his mother Vietnamese. They met in Vietnam when his dad was fighting in the Vietnam War. But what's even more mind-blowing is that how he has made something so ordinary such as playing with bubbles into a full-fledged career. Now, you may be wondering why you have to take your kids to Bubble Legendary; after all, it is 75 minutes (excluding a 15-minute intermission) filled with bits of soap floating in the air. Is there really more to bubbles fun than just blowing bubbles? Well, there is. Tons of it, to be precise. Bubbles inside bubbles, 5-metre long bubbles, smoke bubbles, rainbow bubbles using lighting effects - the monkies sat through the entire show deeply mesmerized. Ale, for one, was going "WAAAH... WOW... WAAAAAAH!!!" during most of the bubble segments and that is the thing - adults might not be too impressed with some of the bubble performances but to kids, the sight of seeing such bubble stunts are pretty amazing and unbubble-lievable! For the finale, we were enveloped in bubble world. Bubbles were drifting in every nook and cranny of the theater, complete with silver and gold lasers creating a sea of glittering specks against a backdrop of dancing lights. All the kids in the audience were deperately jumping everywhere trying to catch the bubbles. Them, and some adults too... like me. It is truly a magical scene that takes you back to that childlike state of experiencing joy and creation in every moment. Even the wifey couldn't help but exclaim that the sea of bubbles was so very enchanting. Here's a short video I managed to sneak that captured the look of excitement on my monkies' faces when bubbles after bubbles descended on them. Granted, the show had some weak parts - the videos felt amateurish and could definitely use some remastering and editing, and I thought that the structure of the show was a bit cheesy as well. The tickets aren't exactly cheap too. I wouldn't recommend the show to 2 young adults out on a date (unless they are huge fans of bubbles) but for a family with young kids, Bubble Legendary is cute, entertaining and ideal for the young ones. 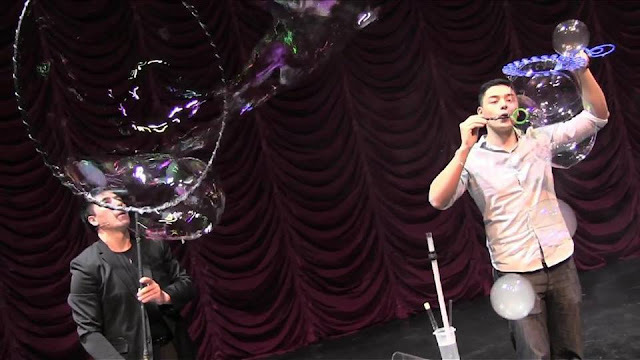 I never really thought of bubble blowing as an art, but Fan Yang and his son definitely left us mesmerized with his unique bubble creations. No prizes for guessing what the monkies requested to play with this coming weekend!